Etching 1st State, inscribed in pencil, signed with initials W de B.
Provenance: from the collection of William de Belleroche. Literature: Jerome and Jean Tharaud. L' Ombre de la Croix, Paris. 1931, book 1 p. 161. A version of this etching ( also from William de Belleroche's collection) was exhibited at the 1952 Brangwyn Royal Academy show (no. 130). Another version (final state) is in the Ashmolen Museum, Arthur Mitchell Collection, acquired in 1964. The text L' Ombre de la Croix, written by the brother Jerome and Jean Tharaud, was published by Editions Lapina, Paris, 1931, in two volumes, and was illustrated with 73 Brangwyn Etchings. 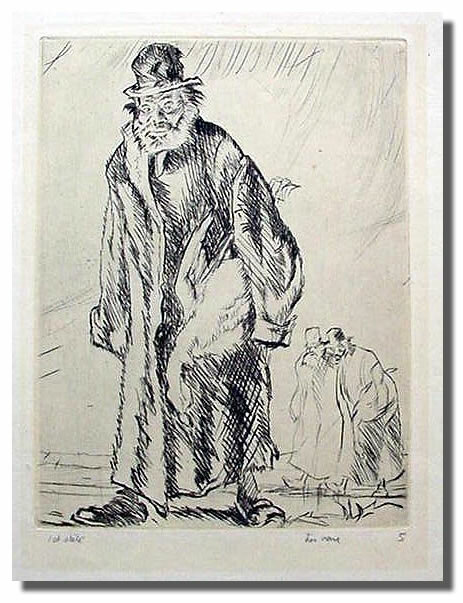 The book describes the lives of Jews in contemporary Europe and many of Brangwyn's illustrations appear to depict the town of Belz in Poland, which was a centre for pilgramage. Brangwyn is not known to have visited Poland and current research suggests that a large proportion of the etchings were based on photographs. Sir Frank William Brangwyn RA RWS PRBA HRSA (May 13, 1867 - June 11, 1956) was a Welsh artist, painter, water colourist, virtuoso engraver and illustrator, and progressive designer. He was born in Bruges, Belgium, where in 1865 his father William Curtis Brangwyn had received a commission to decorate the Basilica of the Holy Blood. In 1875 the family moved back to England. Frank Brangwyn received some artistic training, first at his father's studio, and later from the famous artist and architect William Morris, but he was largely an autodidact without a formal artistic education. When, at the age of seventeen, one of his paintings was accepted at the Royal Academy Summer Exhibition, he was strengthened in his conviction to become an artist. Initially he painted traditional subjects about the sea and life on the seas. His canvas, Funeral At Sea (1890) won a gold medal at the 1891 Paris Salon. The limited palette in this painting is typical of this so-called "grey period". By the late 19th century "Orientalism" had become a favoured theme for many painters. Soon Brangwyn was attracted by the light and the bright colours of these southern countries. He travelled to Istanbul and the Black Sea, by working as a deck hand for his passage. He made many paintings and drawings, particularly of Spain, Morocco, Egypt, Turkey. This resulted in a marked lightening of his palette, a change which did not initially find critical favor. He continued his travels to different parts of Africa and also to South Africa. In 1895 the Parisian art dealer Siegfried Bing, who started the Art Nouveau movement, encouraged Brangwyn into new avenues : mural paintings, stained-glass windows and carpet designs. For his austere but decorative designs he was recognized by continental and U.S. critics as a prominent artist, while British critics were puzzled as how to evaluate him. Brangwyn is best known for the British Empire Panels, a work originally intended for the Houses of Parliament at Westminster, but refused because "too exotic", is now housed in the Brangwyn Hall, Swansea. In 1909 Brangwyn was commissioned to paint the apse of St Aidan's Church, Leeds, but after it was realised that the air pollution would damage the paint it was agreed he should work in glass mosaic. The mosaic was completed in 1916: it covers the whole apse and shows the life of St Aidan. During World War I Brangwyn was an official war artist. He painted the murals inside the dome of the Missouri State Capitol building in Jefferson City, Missouri, and also completed a series of mural panels for the chapel of Christ's Hospital. Eight large brilliantly-painted beaux-arts murals, created for the 1915 Panama-Pacific International Exposition, adorn the walls of the Herbst Theatre in San Francisco. Along with Diego Rivera and José Maria Sert, he was chosen by Nelson Rockefeller to decorate the concourse of the RCA Building in New York City (1930-34) with murals. A sequence of large murals on canvas is held by the Dunedin Public Art Gallery Dunedin New Zealand. There are also works in Olveston (house) in the same city. He was also chosen to decorate a luxury liner. Brangwyn was an artistic jack-of-all-trades. As well as paintings and drawings, he produced designs for stained glass, buildings and interiors, and was an illustrator of books. His choice of approaches was eclectic. The chiaroscuro contrasts in his etchings are reminiscent of Giovanni Battista Piranesi or Rembrandt. Some paintings show the influence of Eugène Delacroix, while in later periods he was influenced by Impressionism, Fauvism, Art Nouveau, the first Vienna Secession (1898) and even Expressionism. In Bruges, Belgium, part of a museum is dedicated to his works. He had kept a special bond with his native city, that had given him an honorary citizenship in 1936, and bequeathed to Bruges a large number of his works.